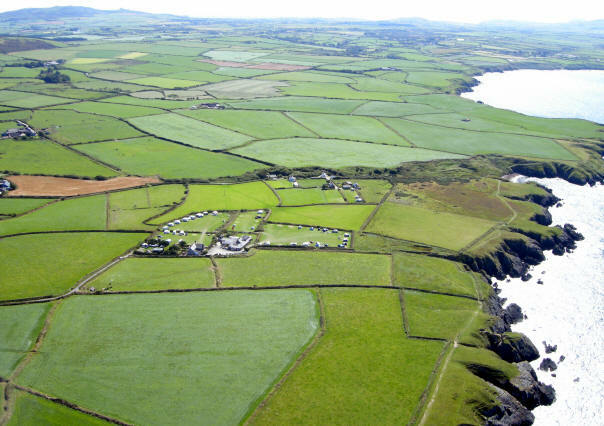 This is a unique and unspoilt location, on the north west coast of the Llyn Peninsula, North Wales. Set back from the sea cliffs, with magnificent views over the sea and countryside. 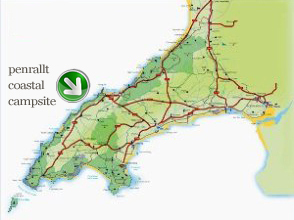 Within an Area of Outstanding Natural Beauty the Heritage Coastal Path crosses our land. The 4 acres of level grassland are divided into 4 separate fields, providing spacious pitches for 20 caravans, 20 tents, 2 pods and a yurt. Here you can watch the sunset over the sea and listen to the waves gently breaking on the shore whilst lying in your tent. Popular with families who return time after time and those who appreciate the natural environment, wildlife, flora and fauna of this diverse landscape. Recognised by "Cool Camping" and "The Guardian" in the list of "Best Campsites in Britain". The coastal path will lead you to rock pooling coves in 15 minutes and sandy beaches within 30 minutes walk. The small natural harbour of Porth Ysgaden, is only 5 minutes away by car. Penrallt has been awarded Green Dragon Accreditation from the Welsh Assembly Government and Gold Standard from Marine Conservation Society for commitment to Environmental Sustainability. From the village of Tudweiliog travel on the B4417 south towards Aberdaron. After passing a lay-by on your left take your first right signposted to Penrallt Coastal Campsite. Follow this road for 1 mile. Passing Tyddyn Mawr Farm on your right, then 2 sharp bends, arriving at a long low stone bungalow on your right Hen Tyddyn Sander. Turn right immediately at the end of the bungalow sign posted to Penrallt Coastal Campsite. To avoid the steep climb on the B4417 over Yr Eifl mountain and narrow roads in Nefyn. Past Trefor village on your right continue along the A499 to Y Ffor village. Turn right onto the B4354 to Boduan. At the T junction turn right onto A497 to Morfa Nefyn. At the T junction turn left ontoB4417 to Tudweiliog. To avoid the congestion in Pwllheli. After passing the village of Llanystumdwy turn right onto B4354 to Chwilog. Continue on to Y Ffor village and cross over the A499 dog-leg junction to Boduan. At the T junction turn left onto B4417 to Tudweiliog.